The evidence of Scripture points to a connection between St. Mary Magdalene and the penitent woman. Immediately after relating the story of the conversion of the woman who had been known as sinner in the city, St. Luke tells us that a number of women followed the Lord, among whom was “Mary who is called Magdalen, out of whom seven devils were gone forth” (Luke 8:2). She is named first in the group, and is the only one about whom information beyond simply her name is given. Can anyone doubt that the penitent woman must have been known in the early Church? Is it at all likely, even on an human level, that after such a display of repentance and affection she would not follow after the Lord and minister to his needs? Can we really believe that the rest of her story would be entirely forgotten by the Evangelist? Not likely. In order to preserve her dignity, St. Luke refrains from naming St. Mary Magdalene directly in the story of her repentance, but he makes the connection by introducing her in the verses immediately following and draws our attention by indicating that she is a woman who has repented from a life of sin as being freed from “seven demons” (representing the seven capital sins). This is a technique common to the Gospels -- consider a few other examples. While Mark and Luke name the tax collector convert “Levi”, St. Matthew uses his more well known name of “Matthew”. The two evangelists cover the shame of the apostle's previous life, while St. Matthew states clearly that he had been a tax collector. Again, the other evangelists do not reveal the identity of the one who struck the high priest’s servants ear in the garden, but St. John names him as Peter – indeed, the Fourth Gospel relates many more details about St. Peter than any other, as John and Peter were very close (evidence from Acts of the Apostles). Thus, in concealing the past sinfulness of St. Mary Magdalene, St. Luke is doing something common to the gospel tradition. The most significant papal approval of the tradition that St. Mary Magdalene is the penitent woman of Luke 7 comes from a sermon of St. Gregory the Great. As this is a sermon of a Roman Pontiff, it has the authority not only as being the words of a saint and Father of the Church, but also as belonging to the ordinary magisterium. In another place, St. Gregory the Great refers to St. Mary Magdalene as the “witness of Divine Mercy” (XL Hom. In Evangelia, lib. II Hom. 25,10) – as she has repented from her life of sin as expressed in Luke 7, and has been united to the Lord by her act of repentance and love. This quote is significant, since it has been taken up by Pope Francis in his recent elevation of the commemoration of St. Mary Magdalene of a true feast. Hence, at least implicitly, Pope Francis has likewise made use of his magisterial authority to teach the Church that St. Mary Magdalene is a “witness of Divine Mercy” as having repented from her previous life of sin and becoming one of the greatest saints in the life of the Church! In addition to the teaching of Pope St. Gregory the Great and Pope Francis, this tradition has been affirmed at least implicitly by countless popes through the ages, and is recognized in the Church’s Liturgy – for the Tradition Mass of St. Mary Magdalene affirms that she is the penitent sinner of Luke 7, and this tradition has again become a normal part of the life of the Church since Pope Benedict XVI has clarified that the Traditional Latin Mass is a legitimate and necessary part of the Church’s liturgical life even today. Additionally, which the Mass of Vatican II does not explicitly state that St. Mary Magdalene is the penitent woman, neither does it reject this thesis. Finally, without quoting the innumerable saints of the Latin tradition, we will simply state that nearly every saint and mystic of the western Church has recognized that St. Mary Magdalene is the penitent sinner. With such a tradition as this, the modern(ist) scholars will have to give strong reasons to prove that St. Mary Magdalene can’t be the penitent woman – as no such reasons can be found, we ought to accept with religious obedience the official teaching of the ordinary magisterium that St. Mary Magdalene is the penitent woman. While some will claim that St. John’s Gospel must be read in total isolation from the other Gospels, the Catholic Church has always known that St. John (who wrote his Gospel last of all) intentionally made only slight references to various points stated more fully by Sts. Matthew, Mark and Luke. This is precisely what occurs in John 11:2. 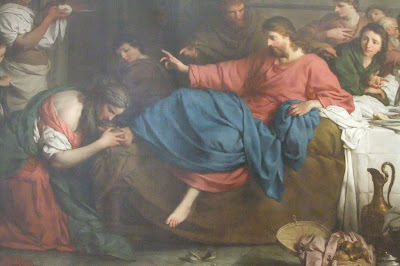 St. John tells us that St. Mary of Bethany is the woman who anointed Jesus and wiped his feet with her hair. While St. John Chrysostom denies that this passage refers to the penitent of Luke 7, St. Augustine and the great commentators of the Latin tradition affirm that this passage most certainly refers to the Magdalene. Indeed, St. Augustine is giving the most natural reading of the text. From the anointing in John 12, shortly before our Lord’s death, we know that the sister of Sts. Martha and Lazarus will be among the women to anoint the Lord in his burial. This was fulfilled when “on the first day of the week, Mary Magdalene cometh early, when it was yet dark, unto the sepulcher” (John 20:1). A final argument, which to my mind is most convincing of all, is based on the Sacred Liturgy. Not only do we point out that the Traditional Mass has enshrined the tradition that St. Mary Magdalene is the sister of Sts. Martha and Lazarus, we further stress that, if St. Mary Magdalene is not St. Mary of Bethany, then the Church has no proper liturgical feast of St. Mary of Bethany! How strange would it be to celebrate the feast of St. Martha, but ignore in the liturgy the sister who has “chosen the better part”! Is it even reasonable to think that, in either the traditional Mass or the Mass of Vatican II, there could be no proper Mass for St. Mary of Bethany? In the modern martyrology, St. Mary of Bethany is mentioned on the feast of St. Martha (which is fitting), but can we possibly believe that the Church would fail to give her a feast day proper to herself? Truly, it is unthinkable! On the other hand, the feast of St. Mary Magdalene falls on July 22, with the feast of St. Martha falling on the octave day (July 29). We know that the octave day of a feast is a “second celebration” of the feast day – hence, the feast of St. Martha is rightly understood as another feast of St. Mary Magdalene. This connection of the two feasts would make perfect sense if, as we have always believed, St. Mary Magdalene is the sister of St. Martha! Obviously, the feast days for these two women were assigned on account of being the true dates of their respective deaths, but surely God arranged it in his divine providence so that we might never forget that St. Mary Magdalene is the true sister of Sts. Martha and Lazarus. The Liturgy teaches us that St. Mary Magdalene and St. Mary of Bethany are one and the same. But in the Benedictine Calendar, and I think in the revision of some calendars there IS a feast of Mary, Martha and Lazarus. There is some incongruity here! Unknown, Correct. I refer to that point when I say, " In the modern martyrology, St. Mary of Bethany is mentioned on the feast of St. Martha (which is fitting), but can we possibly believe that the Church would fail to give her a feast day proper to herself?" But can we really believe that the best St Mary of Bethany gets is a slight reference on the feast of her sister St. Martha (July 29)? Can we really think that the sister who "chose the better part" is just one additional saint among many on the great feast of St Martha? It seems impossible to me. On the other hand, it would make perfect sense for St Mary Magdalene to be commemorated again on her octave day with her brother St Lazarus on the feast of her sister St Martha. \\Can we really think that the sister who "chose the better part" is just one additional saint among many on the great feast of St Martha? In the Liturgy of the Byzantine Churches, both Catholic and Orthodox, St. Mary of Bethany and St. Mary Magdalene are two different people with two different feast days. The Latin Church is NOT the standard of Catholicity, you know. Thank you for the post, Father. I have been uncomfortable with conflating the Mary's before, but this is a very convincing argument. Seeing Mary of Bethany and Mary Magdalene as the same person, especially relating the contemplative nature of the former with the experience of the crucifixion and the resurrection of the latter, is wonderful. You mention St. John Chrysostom's interpretation of John and I wonder if you could talk more about that. If there is such a longstanding tradition of separating in the East, how should we take that? You're over the top! True that the Latin Church is not the only in the Catholic Tradition, but there is only one Pope over the whole world, and the popes have repeated said (from St Gregory the Great to Pope Francis) that St Mary Magdalene is St Mary of Bethany. In any case, I didn't claim that this is a matter of dogma (one's catholicity does not hang on this point) -- if a man (like St John Chrysostom) were to hold that St Mary of Bethany were not the same as St Mary Magdalene, he would still be Catholic, he would just be wrong. There are many points of diversity in Scriptural interpretation of the East and the West. St John Chrysostom is a particularly interesting case -- he has many positions which most of the saints (even many of the east) would later dispute, for example: That St Joseph actually judged the Blessed Virgin as guilty of adultery, or that the Blessed Virgin Mary spoke out of personal ambition and put herself forward inappropriately at Cana or in Caparnaum. Did you know that St. John Fisher wrote an entire book on this subject--that the Three Marys are one and the same, namely, St. Mary Magdalene? In this work, St. John Fisher was opposing Jacques Lefèvre d'Étaples (a sort of protestant forerunner in France), who in 1517 was really the first in the West to oppose the traditional doctrine. I recommend getting a copy and reading St. John Fisher's book. He thought this was an important topic! Anonymous, please use a pseudonym or name. Does not "Magdalene" denote the fact that Mary Magdalene was from the town of Magdala on the shore of the Sea of Galilee? If that was the case, she would be distinct from Mary of Bethany, a village of Judea southwest of Jerusalem. A single Mary cannot be from both Magdala and Bethany. Thank you for your post! I love posts like these that seek to answer questions about scripture we always have wondered about, but are usually not specifically addressed by our parish priests. Anyhow, my only question to your argument would be: why is she called St. Mary Magdalene instead of St. Mary of Bethany? I'm assuming that you're assuming she was known as "Magdalene" because she moved from Bethany to Migdal in Galilee where she could pursue a sinful life far from her family in Bethany? One of the more compelling arguments, which you touch upon, is the fact that Gog, the primary author of Scripture, thought it not necessesary to distinguish the Marys. Hence, they can only be the same woman. In every other case in the NT the person with the same name is distinguished! If a man were born in Boston but lived in New York for 30yrs after college - he could be said to be both from New York and from Boston. Yes! I'd say that is one very plausible explanation! The fact that Mary of Bethany is not mentioned to be at the foot of cross or present anytime during Our Lord's Passion is most implausible when one considers the deep love she had for Our Lord. If there was a reason for her absence I believe the Scriptures would have mentioned it. Mary of Bethany was present and is Mary Magdalene. \\n any case, I didn't claim that this is a matter of dogma (one's catholicity does not hang on this point) -- if a man (like St John Chrysostom) were to hold that St Mary of Bethany were not the same as St Mary Magdalene, he would still be Catholic, he would just be wrong. Popes can be wrong, too. One of the popes (a Celestine, I think) taught an erroneous idea of the Beatific Vision, and Pope Honorius was a monothelite heretic. Of course a particular Pope can be wrong, I'm claiming that the authority of countless popes from St Gregory to Pope Francis makes a good argument in favor of the point. Additionally, the Latin Liturgy is another good argument. And also the writings of the saints and theologians of the west. But I didn't make this post a mere argument from authority - I showed from Sacred Scripture as well that there are many reasons to believe this. You, on the other hand, act like a teenage brat who insists on the opposite point just as a way to spite his parents. Either engage the argument and offer your own biblical and patristic reasons for why Mary of Bethany cannot be Mary Magdalene, or be silent. Bravo. Excellent article. I have now changed my mind on this, having thought otherwise. Lots of moving parts to your argument and a pretty stubborn response to your critics makes me less than convinced. I think the best we can say is that there are different traditions in the Church. Your certainty on this point is puzzling. Why be so definitive on a matter that is murky and on which no doctrinal needs demand precision? By the way a lot of people comment as "anonymous" because the site seems to require a lot to enter a comment under your actual name. Not sure about moving parts -- the only transition is that if Mary Magdalene is the penitent who anointed Jesus' feet, then it is most likely that she is also Mary of Bethany. That seems like a pretty simple premise. I would not want to be dogmatic about this point - insofar as it isn't an absolute. However, it is amazing to recognize that nearly every saint and pope and theologian of the west has been just as certain as I. It has only been the influx of protestant thought in the Catholic Church that has made any Catholic in the west less than cerain. My only point -- don't reject the doctrine just because it is our tradition, give some reasoning. Many, many Blogger readers leave comments under a nom de Web, as it were. I use my real name, but I track people across the Catholic blogosphere easily with their pseudonyms being used for different accounts, e.g. Google, Disqus, etc. The only other figure with such ambiguity is St. James the Lesser, the Just, and/or the brother of the Lord. Matthew, and I have published an article on James the Less which you can find by "searching" him in the search box in the upper right. Anonymous, please use a pseudonym when commenting. The fact that you say "even the protestants" shows the weakness of your arguments. It is a protestant idea to think Mary Magdalene is not Mary of Bethany, and further to claim that she is not the penitent woman. Pope Francis has revived the traditional belief that she is the penitent woman, and in doing so he quotes the sermon of St Gregory the Great in which further connection is made with Mary of Bethany. The new martyrology doesn't even have a proper feast for Mary of Bethany, but mentions her almost as an after-thought on St Martha's day -- is it likely that this is all the honor God would desire for the sister who "chose the better part"? In any case, I made a Sriptural argument as well -- engage the argument, don't just say "I disagree". Just as a reference, I wanted to mention that Seventh-day Adventists (Protestants) also teach that they are the same person. I don't think we are entirely unique in this amongst Protestants as I have in the past read the same in some evangelical writings. The reference to Magdela being where Mary lived and practiced her sinful life before she met Jesus. This changed her life and she returned to original home of Bethany and to her brother and sister where most of her story in the gospel took place. John wrote his gospel many years later, and named her at Simon's feast, which the other gospel writers did not do as they wrote while she was still alive. A interesting article. Thank you. I love this....I have been rereading through the bible again and love that it is ALIVE with truth...this time around my attention was caught on Mary being at our Lords feet many times in scripture. I was rereading and comparing all mentions of all "Marys" and suddenly the thought came to me. "This is the same woman". As a woman with a repentant heart myself and in this part of my later life where I have completely given my life to my Lord & Savior, I can relate to finding her at His feet. I immediately thought to research the distance between Bethany and Magdala. It makes complete sense: she was sinful so she went a distance away. She was wealthy because of her sins: she had the oil to anoint Him. She loved Him, she repented, she returned to her family. This is all makes sense. She is the same: Mary originally from Bethany, life of sin in Magdala, then repented and we find with our Lord and her family. Present with her brother and sister. Also side note: following a sinful life and luxury, she would not have been inclined to do housekeeping over sitting at our Lords feet to hear Him speak. Whereas that was her sisters routine. Printing this article to share.